In December 2017, the Haas Institute for a Fair and Inclusive Society at UC Berkeley and Latino Decisions fielded a statewide public opinion poll to better understand the interaction of Californian's intergroup and identity perceptions with their attitudes towards several policy goals, social values, and responses to messages based on a strategic narrative. This study gives us an initial baseline for understanding where as a state and regionally we are in relation to core pillars of progressive agendas. Following the 2016 US presidential election, which saw the election of a candidate notorious for his exclusionary views and statements on people of color, immigrants, and people with disabilities, California quickly became known as the de facto face of opposition. Progressive leaders and organizations in the Golden State, long known as a bastion of new ideas and richly diverse people, worked swiftly to organize against the new president’s anti-inclusion, pro-corporate, agenda, which included attacks on DREAMers and a travel ban on citizens from seven Muslim-majority countries. Still, California continues to struggle with its own persistent challenges—poverty rates among the highest in the nation, glaring homelessness, and racial disparities across education, employment, wealth, and other areas. To better understand how California can continue to rise as a leading ‘state of resistance’, the Haas Institute sought to gather and analyze new data on Californians’ attitudes in various areas, such as racial equity, immigration, and the role of government, and how those attitudes interact with individual and group identities and unconscious biases. The “California Survey on Othering and Belonging: Views on Identity, Race and Politics” was conducted in Spanish and English with 2,440 adult California residents as part of the Haas Institute’s Blueprint for Belonging Project, in partnership with the polling group Latino Decisions in December 2017. The survey found both areas of progress and areas in which perceptions of progressive advancement should be held with caution. Overall, Californians of all races tended to express pro-diversity and pro-inclusion views, as the poll documented broad-based support for economic justice, racial justice, and immigration reform across age cohorts, state regions, and even across liberal, conservative, and moderate political viewpoints. For instance, around two-thirds of Latino and Black residents rejected the idea that their communities are competing with each other. Some 68% of respondents support support race-conscious policies such as affirmative action. The poll also revealed that Californians have views that may seem contradictory, including the fact that nearly half those surveyed support a so-called “Muslim ban”. Punishing immigrants is still popular: 24% said increasing deportations is very important, and 35% said such a policy is somewhat important. About half the respondents agreed with an individualistic boot-straps narrative about African Americans, saying that Black people need to “try harder”. This broad support for progressive views, alongside some fairly widespread views rooted in more exclusionary and punitive values, point to the powerful role of social movements and public leadership in activating Californian’s more inclusive views. A fundamental takeaway from the survey is that degrees of support and opposition for a policy can vary—sometimes widely—based on how the issue is framed. For instance, when asked how increased taxes on corporations would affect the economy, 58% of respondents say it would hurt or make no difference. Yet, 68% think big businesses and corporations are not paying their fair share of state taxes. The poll suggests that potential support is high for a pro-equity policy vision, but that this support must be cultivated and sustained through outreach and information campaigns. This is the first in a series of research briefs that Haas Institute will publish analyzing the survey results. Future briefs will compare regions within the state and examine the responses of sub-populations such as young adults and unregistered voters. For detailed statewide findings and comparisons of racial groups and regions, see here. For detailed findings broken down by gender, age, income, education, union membership, and other demographics, see here. For detailed findings comparing respondents with different views on race, see here. For a copy of the survey questions, see here. Note: The entire state of California was sampled and oversampling was conducted in the six geographies indicated above to allow for reliable comparisons of these regions. 58% say that raising taxes on corporations would either hurt the California economy or make no difference. On the whole, Californians tend to dislike corporations, think that big businesses and the rich have too much influence in politics and do not pay their fair shares of taxes, agree that economic inequality is a major problem in the state, and think that the government needs to do more to alleviate poverty and provide services to Californians. Further, Californians have a generally positive view of labor unions. 59% of Californians dislike corporations, rating them below 50 (on a 1-100 scale). 61% say that corporations have too much influence in California politics. 68% think big businesses and corporations are not paying their fair share of state taxes. 58% think that raising taxes on corporations would either hurt the California economy or make no difference; 42% think it would help the California economy. 58% think that the rich are not paying their fair share of state taxes. 42% think that there is too much attention paid to race and racial issues in our country; 41% say too little attention is paid them. 67% reject the idea that inequality is inevitable, instead agreeing that collective action is necessary to alleviate poverty. 46% think that the government should play a major role in reducing income inequality, while 54% say the government should play a minor role or no role at all. 66% of Californians think that labor unions improve the lives of working people. 54% to 63% have positive views of labor unions (depending on how the question is asked). Californians are relatively progressive on racial issues. 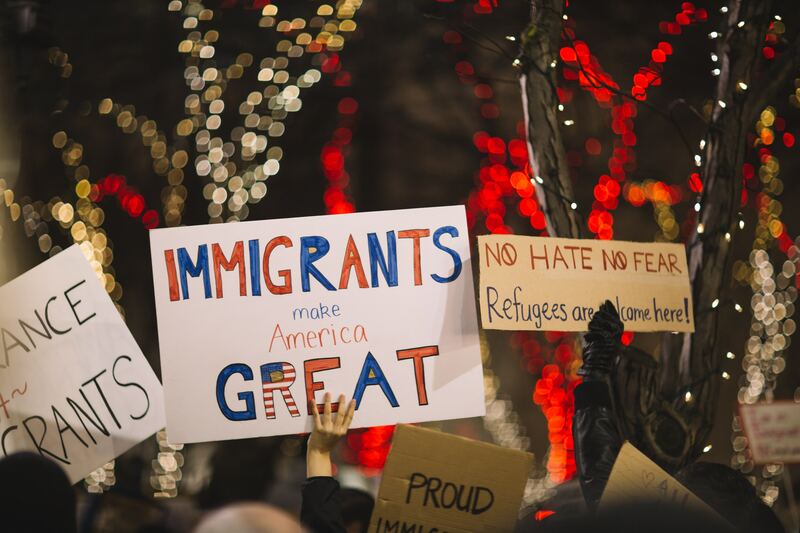 Most support refugee resettlement, hold positive views towards other racial and ethnic groups, perceive little competition with other groups for jobs or housing, think immigrants are a boon to the state, and support progressive immigration legislation. However, there are tensions and significant percentages of people harboring anxiety or resentment toward other groups, such as the half of respondents who support a ban on people from Muslim majority countries from entering the US. 73% of Californians hold positive views toward Asian Americans; 73% say that members of the group are intelligent. 75% hold positive views toward Latinos; 57% say that members of the group are intelligent. 70% hold positive views toward African Americans; 51% say that members of the group are intelligent. 69% hold positive views toward whites; 59% say that members of the group are intelligent. 59% of Californians say that having an increasing number of people of different races, ethnic groups, and nationalities makes America a better, not worse, place to live. A majority of African Americans (58%) rejects the idea that jobs going to Latinos results in fewer good jobs for them. The same goes for Latino (70%) attitudes towards African Americans. Majorities of African Americans (69%) reject that Latinos moving into good neighborhoods reduces their access to good neighborhoods. The same goes for Latino (71%) attitudes towards African Americans and good neighborhoods. Majorities of Californians reject that the cultural practices of African Americans (77%), Latinos (77%), Asians (77%), or immigrants (74%) disrupt their way of life. 71% of Californians think that establishing a pathway to citizenship is somewhat or very important. 79% support a pathway to citizenship for DREAMers. 66% reject the idea that the U.S.-Mexico border wall is an important immigration policy priority. 64% agree that the state should limit hospital, school, and law enforcement cooperation with federal immigration officials. 67% think undocumented immigrants should be able to purchase health insurance on the California state exchange. Paradoxically, however, 24% said increasing deportations is very important, and 35% said such a policy is somewhat important. 70% of Californians agree that immigrants strengthen our country through their hard work and talents. 24% said it is very important to increase deportations of undocumented immigrants, and 35% said such a policy is somewhat important. Californians generally support diversity of beliefs and the idea that respecting cultural difference is important. At the same time, almost all agree that trying to assimilate by blending into society and speaking English is a very important part of being an American. On average, Californians see their race/ethnicity as important to their identities, although the exception includes the majority of Whites. A large majority of Californians believe global warming is real and caused by human activities and think that the government should play a role in protecting the environment. More than three quarters of Californians believe the state should do more to ensure that everyone has access to health insurance. 58% think that spending to protect the environment should be increased. 86% agree that it is the government’s responsibility to impose strict laws to regulate industries that pollute the air or water. 72% think that protecting the environment doesn’t slow economic growth but rather encourages innovation and growth. 62% reject the idea that access to healthcare should be based on a person’s wealth or income. 77% of Californians think that the state of California should do more to ensure that everyone in California has access to health insurance. 58% think government should provide more services than it does now. Though the differences are not often large, Whites, and to a lesser extent, Asian Americans, are more opposed to economic redistribution, feel warmer towards corporations and big businesses, and are least likely to favor government expansion of services. With regards to race, immigration, and racialized policy, there is a considerable amount of agreement between Latinos, African Americans, and to a lesser extent, Asian Americans. Whites are generally, across the board, cooler toward racial and ethnic minorities, immigrants, and policy proposals to reduce racial inequality. Across all racial groups, more than three quarters believe economic inequality is a major problem in California. Whites are more likely than any other group to say that they think the government should provide fewer services and the most likely to oppose state provided resources. Latinos appear to have similar attitudes towards inequality and redistribution. Asian Americans generally fall somewhere between these two groups and Whites. Interestingly, despite the fact that Blacks and Latinos have the fewest resources on average, and lost the most during the 2008 recession, they appear to be the most optimistic about their financial future compared to Asian Americans and Whites. Overall, Californians believe big corporations have too much influence in California politics, with 61% of respondents reporting this sentiment. Across all racial groups, more than two thirds believe big corporations pay too little in taxes. Generally speaking, Whites and Asian Americans had cooler attitudes towards refugees, Muslims, and undocumented immigrants, and are less likely to support racially progressive policies, less likely to think that racism is a problem, and the most likely to think neo-Nazis and white supremacists are just a small isolated group of individuals. Asian Americans had the coolest attitudes towards Latinos and African Americans. Asian Americans and Whites expressed the strongest perception of ally-ship and perceive the least amount of competition. In questions regarding competition for neighborhoods and jobs, Black Californians are more likely to see their main competitors as Whites, not Latinos. Black and Latino Californians are more likely than any other two groups to see one another as more enemies than allies, but only by a slight margin. On the other hand, a majority of African Americans reports very warm feelings (75+ on a 0-100 scale) towards Latinos. Assimilation sentiments were generally strong in survey respondents, with 73% of respondents reporting that it is either somewhat or very important to blend into the larger society. Majorities of Latinos (53%) and African Americans (67%), as well as 47% of Asian Americans, felt that Whites have too much influence over politics in California. One in five Whites and Asian Americans believe Latinos have too much influence. Majorities of Latinos (53%) and African Americans (67%), as well as 47% of Asian Americans, felt that Whites have too much influence over politics in California. Bivariate regression analyses were conducted on several polling items to identify relationships between immigration resentment, recession effects, racial resentment/liberalism, and perceptions of government with different survey responses. These relationships are summarized below. Participants of the survey were asked about their sentiments towards several immigration policies, including: state coordination with ICE, building a wall with Mexico, increasing deportations, repealing DACA, restricting healthcare to undocumented immigrants, and obstructing pathways to citizenship. Survey respondents who indicated higher immigration resentment in their responses were significantly more likely to support punitive immigration policies (such as those stated above) than respondents with lower levels of immigrant resentment. A significant relationship was found between anti-Muslim sentiments and anti-immigrant policy attitudes. Respondents with colder views towards Muslims were more likely to support punitive immigration policy than those who held warmer views. Respondents with higher levels of immigrant resentment were less likely to think that economic inequality is a problem in California than those who exhibited lower levels of immigrant resentment. Similarly, respondents with higher levels of immigrant resentment were less likely to think that the government should do more to reduce inequality than those with lower levels. Respondents with higher levels of immigrant resentment were less likely to think that economic inequality is a problem in California than those who exhibited lower levels of immigrant resentment. Participants of the survey were asked if they were personally affected, or knew people who were affected, from the great recession of 2008-2009. Some of these questions included if participants had lost their home, became unemployed, had to use credit cards to pay for basic expenses, or were uninsured because they could not afford health insurance. In addition, the survey asked if participants believed that economic inequality is a problem in California, and if the government should do more to reduce inequality. There was some, but minimal correlation overall between those who were affected/knew of people affected by the recession and the belief that economic inequality is a problem in California. Similarly, there was minimal correlation overall between those who were affected/knew of people affected by the recession and the belief that the government should do more to reduce inequality. There was minimal correlation between those who were affected/knew of people affected by the recession and the belief that the government should do more to reduce inequality. Participants were asked their views on several issues of racial equity, including Black Lives Matter, police brutality, and racial profiling by police. There was a significant relationship identified between participants who expressed high racial resentment and opposition to racial equity. Those who expressed higher racial resentment were far less likely to support Black Lives Matter, far more likely to think that police brutality is not a problem, and far more likely to think that police treat all races the same. Similarly, racial resentment was tested against economic inequality variables, including the questions stated above in the Recession Effects section. Participants who expressed higher levels of racial resentment were less likely to think that economic inequality is a problem in California, or that the government should do more to reduce inequality than those with less racial resentment. Californians who expressed higher levels of racial resentment were less likely to think that economic inequality is a problem and that the government should do more to reduce inequality. Participants were asked about progressive economic views, including opinions about big businesses paying their fair share of taxes, big businesses and corporations being too powerful, government intervention in inequality, and if economic inequality exists in California. Participants who expressed more racially inclusive views were significantly more likely to support progressive economic positions (i.e., those who believe that big businesses are too powerful, that big businesses are not paying their fair share of taxes) than those who held more racially conservative views. Participants were surveyed if they believe that the federal government cared what they think, if they trust the federal government to do what is right, if they believe that the state government cared what they think, and if they trust the state government to do what is right. These variables were tested against whether or not respondents reported voting in election years of 2012 and 2016. No significant relationship was found between respondents’ trust in the government and whether or not they voted in the 2012 and 2016 election cycle. This survey was created​ by the Blueprint for Belonging ​project, to find more videos, essays, and podcasts from this series click here.